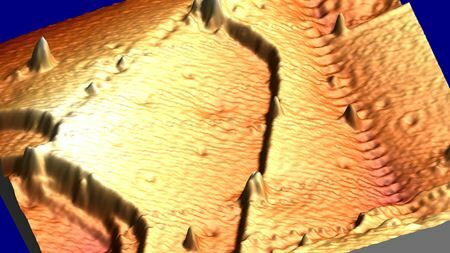 High-resolution study of a nanocrystalline copper surface reveals a pattern of tilted grains creating a landscape of valleys and ridges. 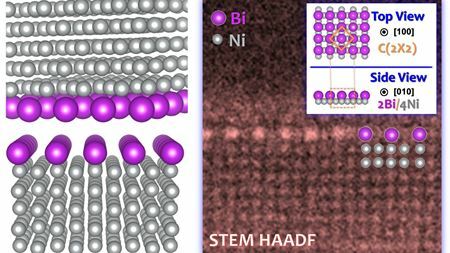 Scientists have unexpectedly discovered ordered, segregation-induced superstructures at general grain boundaries in polycrystalline alloys. Coating paper with gold nanoparticles produces a flexible supercapacitor that could be used to help power wearable devices. Using dynamic atomistic simulations, researchers have resolved every ‘jiggle and wiggle’ of atomic motion that underlies metal strength. Using zirconium-based nanoparticles, researchers have developed a novel technique for successfully 3D printing high-strength alloys. Micrometer-sized particles can be used to stabilize beer foam, and could also lead to the development of advanced functional materials. A new study shows that animals spin silk by pulling rather than pushing it out of their bodies, which could improve the processing of synthetic materials.